Off the back of a barrier trial win a few weeks prior, two-year-old colt Odyssey Moon (Snitzel x Run To The Moon) made an extremely successful debut, winning the $250,000 RL Inglis Nursery at Royal Randwick in fine style over 1000m. Jumping away from the outside barrier in the 15 horse field, jockey Tye Angland urged the colt forward before settling just behind the leading division. As they rounded the home turn and the last start runner-up Let’s Make It Rain drove through a gap and went for home, the Rod Northam-trained Odyssey Moon knuckled down and charged to the line to record a neck victory over Kimberley Star (Inglis Easter) with Let’s Make It Rain (Inglis Classic) staying on for third. Recording a time of 58.41 on the rain affected track, Odyssey Moon joins an illustrious list of previous winners, with each progressing to record stakes success highlighted by last year’s winner Mossfun (Mossman x Eye For Fun) who went on to claim the Group 1 Golden Slipper having also won the Inglis Nursery on debut. 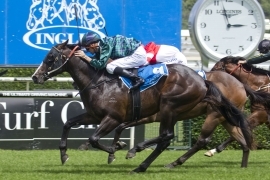 Bred by Arrowfield Group Pty Ltd and Jungle Pocket Pty Ltd, Odyssey Moon was initially purchased for $25,000 by Rod Northam at the 2014 Inglis Classic Yearling Sale Summer Book, before the colt went through the Inglis The Star Ready2Race Sale where he was then purchased by James Harron Bloodstock for $120,000 before being sent back to Northam to train. Consigned by Mr A. Cook, footage of the breeze up can be viewed by clicking here. Racing in the silks of Dr and Mrs Bateman, the same colours carried to victory by numerous Inglis graduates including Group 1 winner Foxwedge (Inglis Easter), Group 2 winner Satin Shoes (Inglis Easter) and Group 3 winner Ashokan (Inglis Easter), the history of the Inglis Nursery says it won’t be long before Odyssey Moon adds to that illustrious list. With $145,000 going to the winning connections, trainer Rod Northam specifically targeted the Inglis Race Series for this colt. "I saw him as a yearling and liked him and saw he was going back through the Ready2Race and said to James you have to come and see him." “I told James ‘you’ve just bought the Slipper winner' and he said ‘I hope so because you’re training him," Northam added. “I was only kidding about the Slipper but he’s a really nice horse. "I think he’s more of a 1200-metre horse so to win today at 1000-metres is just great,” he added. Tye Angland was also impressed with the victory. “I was worried on the home turn but after barging his way out he really found the line," stated Angland post-race. "I was surprised how well he picked up. "The best part of his race was the last 100 metres,” he said. In addition to the race prizemoney on offer, the winning trainer of the race received a set of Swarovski Optik EL 42 Swarovision binoculars valued at $3,000, while the winning jockey and the managing owner also received an exclusive piece of Antler Luggage valued at $544. The next race in the Inglis Race Series is the 3YO NMW Handicap (1250m) to be held at Canterbury racetrack on January 26, where a $50,000 bonus will be on offer to eligible runners. The complete list of Bonus Races in the series can be viewed here. Next year’s edition of the Inglis Classic Yearling Sale Summer Book, the very sale that Odyssey Moon was secured at will be held on February 8, 9, and 10, where 10 yearlings by Snitzel have been catalogued.